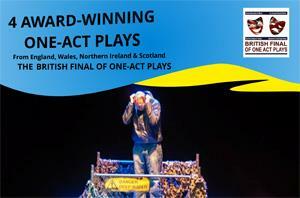 The British Final of One-Act Plays is one of the most prestigious amateur drama events in the land. It features the champions of national festivals run by the All-England Theatre Festival, the Drama Association of Wales, the Scottish Community Drama Association and the Association of Ulster Drama Festivals who compete, over two evenings, for the coveted Howard de Walden Trophy. The event will be presided over by Robert Meadows, a distinguished member of the Guild of Drama Adjudicators. Don’t miss this wonderful opportunity to enjoy British community drama at its finest!